At 829.84 meters in height (2,723 ft), the mixed-use skyscraper known as The Burj Khalifa is the tallest manmade structure on Earth. 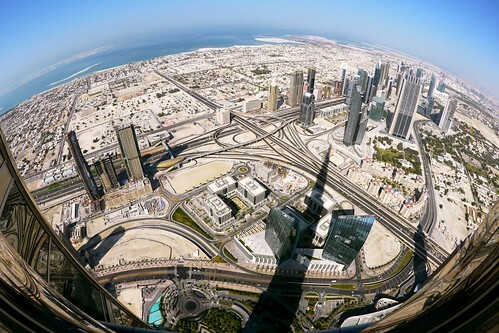 At 452 meters high on the 124th floor, the "At the Top" Experience is the 3rd highest building-based viewing platform in the world, and the highest outdoor observation deck in a skyscraper. The World Islands are visible in the upper left.